Consider the d.c. shunt generator shown in the Fig. 1. The internal characteristics is E Vs IL while the external characteristics is Vt against IL. Ideally the induced e.m.f. is not dependent on the load current IL or armature current Ia. But as load current increases, the armature current Ia increases to supply load demand. As Ia increases, armature flux increases. Let us see the nature of these two characteristics. Note : The effect of flux produced by armature on the main flux produced by the field winding is called an armature reaction. Due to the armature reaction, main flux pattern gets distorted. Hence lesser flux gets linked with the armature conductors. This reduces the induced e.m.f. Note : Thus the armature conductors. This reduces the induced e.m.f. This is shown in the Fig. 2. For d.c. shunt generator we know that, E = Vt + Ia Ra neglecting other drops. So as load current increases IL, Ia increases. Thus the drop Ia Ra increases and terminal voltage Vt = E – Ia Ra decreases. But the value of armature resistance is very small, the drop in terminal voltage as IL changes from no load to full load is very small. This is shown in the Fig. 3. Hence d.c. shunt generator is called constant voltage generator. Why shunt generator load characteristics turns back when overloaded? 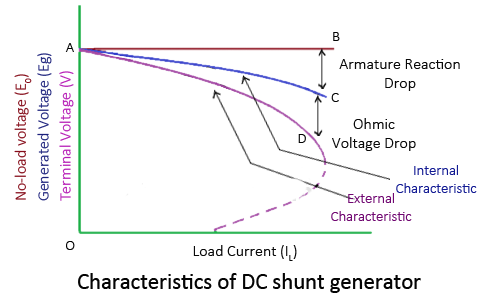 Consider the external characteristics of d.c. shunt generator as shown in the Fig. 3(a). From to point P, the load resistance decreases hence load current increases and due to Ia Ra and armature reaction, the voltage decreases by small amount. Hence characteristics is drooping in nature. But if the load resistance is reduced beyond point P i.e. load IL is increased beyond P then it increases momentarilly. This is very large current and generator gets overloaded. Due to such a large current the armature reaction is severe and drop Ia Ra is also large due to which the voltage Vtdrastically reduces. This causes the current to decreases from P to Q, rather than increasing. Thus on the curve pqr, the voltage goes on reducing rapidly and at point r becomes zero. Thus beyond point p, if the generator is loaded, the load characteristics turns back till the generator gets short circuited and the curve meets x axis at point r where voltage is zero. At this point, small E is present due to residual magnetism. Note : In portion to p, the effect of decrease in load resistance dominates the effect of change in Vt as change in Vt is very small. While in portion ‘pqr’, the drastic reduction in Vt dominates the effect of decrease in load resistance hence curve turns back, reducing the load current.